June 15 is Father's Day. 40 years in public accounting. Second quarter 2014 estimated tax payment is due June 16. California LLC "fee" payment is due June 16. Michael Gray will be out of the office part of June. Do you need help with extended income tax returns? IRS changes position on California short sales and foreclosures. Trusts and estates must allocate "bundled fees." Facilities upgrade incentives are taxable income. Visit our new article: The Direct Mail Solution. 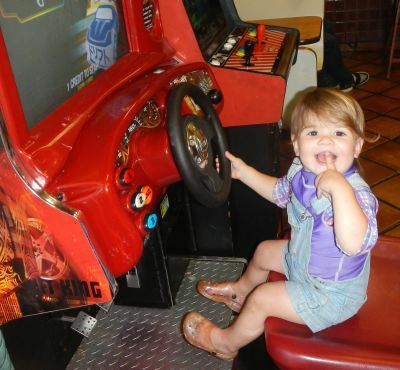 Minerva Siemer takes a video game for a spin. Now is the time to honor and express appreciation to your father and other fathers who have contributed to your life. Remember Father's Day on Sunday, June 15. Some students have already graduated, but June is the traditional "graduation month," especially for high school seniors. For those who have graduated or will graduate this spring, congratulations. High school graduation is one of a few rites of passage to adulthood that remain in our society. Graduation is especially an accomplishment for parents, who graduates should also thank. This isn't an ending, but a beginning. Now the real work of becoming independent starts. Good luck! It's graduation time, which reminds me that 40 years ago I graduated with an accounting degree from San Jose State University. I was fortunate that Alex Berger, CPA gave me my first job in public accounting at Berger, Lewis and Company. Alex Berger and Griff Lewis were my first mentors in the profession, followed by Ken Wood, Ron Vlastelica and Ed Galus at KMG Main Hurdman. Rich Hubler invited me to join him to form our partnership, Hubler, Gray and Associates, in 1986. Rich and I split up in 1996 and I have had my own CPA firm ever since. I still have some of the same clients that I started working with at KMG Main Hurdman in 1978. I'm grateful to have had a career that has supported my family and allowed me to be of service to others for forty years. Many others aren't so fortunate. The second 2014 estimated tax payment for individuals and calendar year corporations, estates and trusts is June 16. California requires some taxpayers to make estimated tax payments electronically, generally using Web Pay at www.ftb.ca.gov. The IRS also requires that businesses make their payments electronically, generally at www.eftps.gov. California assesses a "fee" when LLCs doing business in California have at least $250,000 of gross income. The estimated fee payment for calendar year LLCs for 2013 is made for Form 3536 online using Web Pay at www.ftb.ca.gov and is due June 17. The fee payment is "protected" from penalties when it is for at least the fee amount on the last year's LLC income tax return. The annual Foreign Bank Account Report (FBAR), FinCEN Form 114, for 2013 is due June 30, 2014. This is a new Form number to replace old TD F 90-22.1, but the information requested is basically the same. THE FORM MUST NOW BE EFILED, NOT MAILED. The form is required for foreign bank and brokerage accounts either owned by a U.S. citizen or resident or over which a U.S. citizen or resident has signature authority. It also can apply to foreign financial accounts such as life insurance policies that have cash surrender values. The report is required when the total balances for the accounts equal or exceed $10,000. This is a separate report from your income tax return, and no extension of time to file is allowed. The penalties for failure to report are severe, and the IRS is on the war path about enforcing this reporting requirement, even though no tax may be involved. You can get the form at www.fincen.gov/forms. Michael Gray will be out of the office for a conference from June 11 through June 13. Make your appointment now. The IRS sent a letter dated April 29, 2014 to Senator Barbara Boxer, updating previous advice in a letter dated September 19, 2013. The IRS has changed its position relating to "recourse" mortgage loans when there is a short sale or foreclosure. These are usually mortgages resulting from refinancing previous debt, not relating to the original purchase of a principal residence. Now the IRS says these mortgages are not eligible to be treated as nonrecourse debt. Cancellation of nonrecourse debt is treated as sale proceeds, and usually cancellation in a short sale or foreclosure will not result in cancellation of debt income. Senator Boxer has asked for relief for taxpayers who relied on the IRS's letter of September 19, 2013. The IRS has issued final regulations relating to whether deductions of estates and trusts are subject to the 2% of adjusted gross income floor. The most controversial item for the regulations is "bundled fees" - fees charged by banks and brokerage companies for acting as trustees or executors. The fees include an amount for managing investments that hasn't been stated separately. The IRS, citing the Supreme Court ruling for Michael J. Knight, is requiring the fiduciary to allocate a portion of those fees to investment expenses, subject to the 2% floor. Under the regulations, any reasonable method may be used to allocate the fees. Under the final regulations, tax return preparation fees to prepare the federal estate tax return, the decedent's final income tax return, and income tax returns for the estate or trust are not subject to the 2% floor as administration costs. Other tax return preparation, including catching up for back years' income tax returns and preparing gift tax returns are subject to the 2% floor. Appraisal fees relating to tax return preparation for an estate or trust are not subject to the 2% floor as administration costs. The final regulations are effective for tax years beginning after May 8, 2014. Motor vehicle manufacturers have been offering incentives to franchised dealerships to upgrade their facilities. The dealerships have been accounting for these payments inconsistently, including excluding the payments from income as capital contributions and reducing the cost of the improvements for the amounts received as incentives. The IRS Chief Counsel has issued an advice memorandum concluding the amounts should be reported as taxable income. The Chief Counsel cited John B. White, Inc. v. Commissioner, 55 T.C. 729 (1971), affirmed 458 F. 2d 989 (3d Circuit, 1972) as a case with a similar situation and conclusion. "Therefore, the dealerships have an accession to wealth over which they have complete dominion and control. Accordingly, the dealerships must recognize gross income at the time they receive Payments or appropriately accrue the right to receive Payments under their methods of accounting. The IRS noted the dealerships will eventually recoup the income by depreciating the improvements. Here are the scheduled interviews for June and July. June 20, 2014, Hilary Martin Hendershott, CFP(r), The Family Wealth Consulting Group, "Why most people will never achieve their financial goals"
July 25, 2014, Craig Martin, CFP(r), The Family Wealth Consulting Group, "The role of emotions in investing"